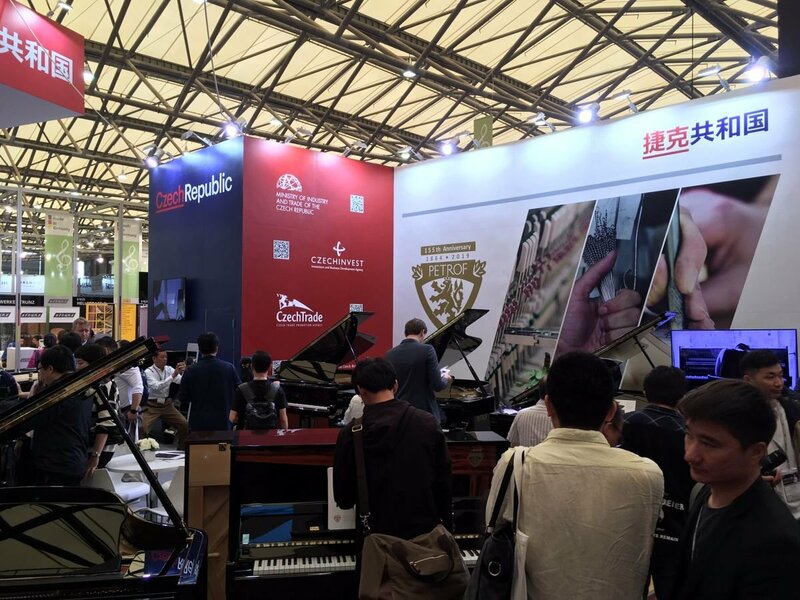 The PETROF company has attended the largest international musical instrument trade fair MUSIC CHINA 2018, held in Shanghai from 10th to 13th October 2018. The event was taking place in 12 pavilions on a total of 125,000 square metres where over 2,000 exhibitors were presenting their instruments. More than 100,000 visitors from 81 countries attended the fair and were thus given an opportunity to get acquainted with the newest trends, development and products from diverse fields of the music industry. PETROF shared its stall with other Czech musical instrument manufacturers pertaining to the Association of the Musical Instruments Makers of the Czech Republic, and the Czech stall once again achieved a great popularity. “Our stall enjoyed the visit of numerous business partners, journalists, pianists, technicians and even members of the general public. We introduced our visitors to two brand new jubilee instruments – the upright pianos ‘Walnut Root’ and ‘Tiger Wood’, which had been produced in a limited edition for the occasion of the 155th anniversary of the company’s foundation,” stated Adam Prousek, PETROF Marketing and Innovation Director. “PETROF’s grand and upright pianos have registered very positive responses at the trade fair, for which we are truly grateful. At this moment, we can already say that the participation at the Shanghai trade fair has again reinforced our market position. The Chinese market is crucial for us, and naturally enough, every such success delights us indeed. Everyone who has contributed to it deserves a great acknowledgement. We thank all our colleagues and business partners and we look forward to future collaboration,” said Zuzana Ceralová Petrofová, PETROF’s CEO.